This time of year is also a time when we fixate on the bunching up of wealth and treasure, combining it with a concentrated reverence for the importance of giving. We save up all our shopping, to run out on or after “Black Friday” to make this time we give while giving less the rest of the year. Our holiday stories are also about studies in contrast having to do with the bunching up of the “Yuletide Treasure” that we sing about in in “Deck The Halls”: Dickens’ Scrooge is a miser who for years collects wealth by the sharp moves he makes at the expense of others (later with a change of heart he is able to be freely generous with that same accumulated wealth), Theodore Geisel (Dr. Suess) envisioned the mean-spirited Grinch, a reverse-Santa Claus, who, intending to steal them, collected up in the sack on his back all the presents the entire community had intended for each other (later with a change of heart he is almost like a real Santa Clause by simply being able to return to the community what was theirs to begin with), and then there is the magical fable of “It’s a Wonderful Life” where the villain (who never has a change of heart in the story) is the mean Mr. Potter whose goal (realized in one of the film’s two competing alternate realities) is to own everything in the community so that if anyone wants a job or the comfort of an inviting home they have to come “crawling” to beg from him. Noticing New York’s seasonal tradition has been to run annual reminders of how closely the “It’s a Wonderful Life” fable parallels the very real facts about the way that Bruce Ratner and his Forest City Ratner company have been assisted by government with atrociously deep subsidies and abuse of eminent domain to acquire a mega-monopoly in Brooklyn at everyone else’s expense. It is exactly the kind of study in contrasts on which we fixate at this time of year. There are certainly those who look upon the “Barclays” Center and see impressive value there; They crow about the spectacle of its glitter. A frequently used metaphor for a glittering and startling concentration of wealth piled up in one place is that of the treasure chest. Some people who make proclamations about what Brooklyn has gained with the “Barclays” Center, people like Ratner, Prokhorov, Bloomberg, Markowitz, and Charlie Rose gloat over the arena's glitter. I see what they are gloating over as representing much the same thing as a treasure chest. Like a treasure chest, the “Barclays” Center undeniably gleams with heaps of accumulated value. But the “Barclays” Center, like those fictional fairytale treasure chests, comes by its impressive heaped up gleam because it is an accumulation of pirate booty, illegally seized and hoarded. All that piled-up wealth represents the brooches and necklaces that are not out in the community being worn as adorning ornament by the ladies, it’s the candlesticks and silver that are not festooning local dinner tables, it represents the gold that is not circulating through and enriching the general commerce of the community. It also represents the cost of the fear, violence and suffering when that wealth was wrested from its original owners at sword point or with the discharge of blunderbusses. The thing to remember is that the revelry around the glint and gleam of the “Barclays” Center is, at its core, a celebration of an immense and unforgivable transfer of wealth from the local community to a force of marauders. And, in contrast to all that bunched-up wealth there are the vast seized acres, there are the empty and underutilized parking lots that lie at the back of the arena, there are the nearby homes where the sound of the arena's bass penetrates in. In “It’s a Wonderful Life” Mr. Potter always had a glamorous mansion, perhaps even more so, after seizing the bulk of the town: The question was whether it was worth having to crawl to him and beg for a job from him when he was the only game in town. What is the glamorous glitter worth when Barbra Streisand plays Ratner’s arena but the public is highly subsidizing her performances to the turn of perhaps $700,000? That is just the Grinch giving back what was the community’s in the first place. It is actually worse because when the Grinch gave back the stolen presents he gave back everything totally and freely, relinquishing all claim. 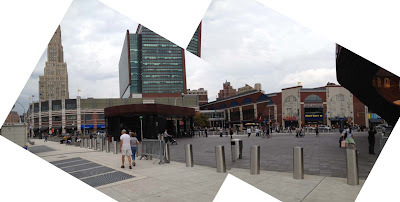 When Ratner invites people into the “Barclays” Center he is like Mr. Potter, charging $4.50 for water that would have been free with the music at Freddy’s Bar, just one of the parts of the neighborhood removed as part of Ratner’s taking spree. In the end the glitter of how much richer Ratner has become is, like in all the other traditional tales of the season, just a measure and metaphor for the off-screen impoverishment of the community. Here are past Noticing New York stories that probe the “It’s a Wonderful Life” parallels in greater depth. Just one last thought. . .In the end all these tales have the same moral: It isn’t about bunched-up wealth. That isn’t what has value. The value of life is all about sharing and people in the community mutually supporting each other with real giving. Bruce Ratner, from City & State's list of the 100 most powerful people in New York City- Where on the list does he belong? Read on. Readers might sometimes ask, as I often ask myself, why do I write so much about Atlantic Yards? Noticing New York was not created like Atlantic Yards Report for the exclusive purpose of covering the Atlantic Yards story. It was created to write about development in New York City and associated politics, the ways in which the city is shaping itself as a place to live. Nor was Noticing New York created with a conscious intent to just carp about what I am critical of. I’d be writing more often (as was my original intention) about those things that can be praised if I saw them as comparatively more important. (Often I do praise forms of development unfolding naturally in the city but do so in the context of pointing out what the real estate industry is doing to thwart or undermine such progress.) My goal has been to prioritize, to write first about those things that most glaringly need to be pointed out and emphasized in the public dialogue. I could be writing more often about some of the other things that I’ve written about, like the dismantling of Coney Island, Hudson Yards, the Columbia University takeover of West Harlem, how a hospital, St. Vincent’s, was transformed into a real estate project which was all that was left when the hospital then went bankrupt, or how the city is handling growing density. I could also write about things that I have not yet gotten around to writing about but ought to, such as the NYU expansion. By contrast, the Atlantic Yards narrative is a stark one involving far fewer shades of gray with its developer-driven purpose of transferring more wealth and power to those in whom wealth and power is already concentrated, the cheating and dishonesty, poor urban design and the persistent perversions of process. It embodies in stark relief virtually every highly objectionable form of conduct in which local public officials and the real estate industry engage that sap the quality of life in this city. If people can’t understand the Atlantic Yards narrative there is little hope that the populace will understand what is needed in order for this city to be properly governed and to avoid an impoverishment of the city . . . but if they do understand Atlantic Yards, it becomes a prism through which to understand so much else happening in this city that similarly needs to be addressed. But you have to start with the worst: If you can’t stop the worst excesses then everything else is up for grabs. I offer all of the above as prologue to calling your attention to Norman Oder's Atlantic Yards Report story on City & State's publication of its list of "the 100 most powerful people in New York City politics." Mr. Oder points out, with itemizing information and analysis about 33 of those named, that fully one-third of the 100 individuals are critically intersected with the Atlantic Yards mega-project in one way or another. Mostly they intersect as supporters of the mega-monopoly. Only a few intersect as possible opponents who have been neutralized (the latter group including State Attorney General Eric Schneiderman who, having accepted money from Bruce Ratner, hasn't investigated Atlantic Yards despite the hopes he offered in that regard when running for his office). 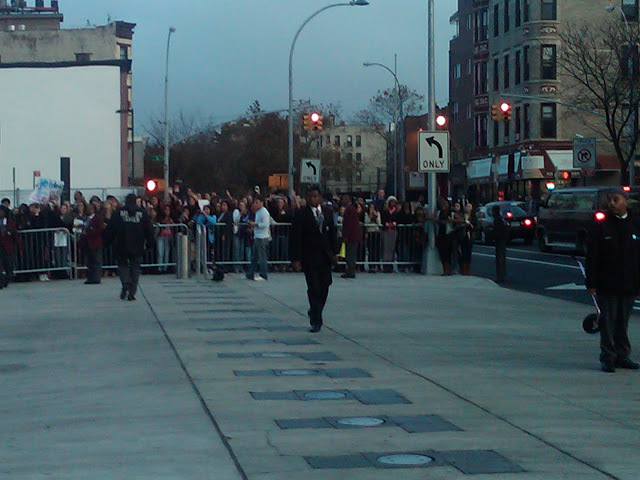 See: Wednesday, December 05, 2012, The NYC Power 100 and Atlantic Yards: many intersections (and Ratner behind Markowitz?). The remarkable thing is that Bruce Ratner, the developer/subsidy collector behind Atlantic Yards, is ranked as only the 59th most powerful individual on the list given all the ways Atlantic Yards is insidiously integrated into the New York power structure and is subserviently being supported by so many theoretically powerful individuals Mr. Oder notes the anomaly that Bruce Ratner is ranked as less powerful than Brooklyn Borough President Marty Markowitz (who is at #40), “AY's biggest cheerleader”, now a lame duck. Whose payroll will Markowitz wind up on when he leaves office at the end of his expiring term? Up till now he has been getting money from Ratner for his long-term favorite activity, concerts put on with a “not-for-profit” structure. Putting aside any rationalizations that people might use to dress up their positions, Atlantic Yards, when honestly assessed, can only be evaluated as a boondoggle that's deeply destructive to the fabric of the city. It is therefore frightening to think that so many of the city's power elite are aligned behind making it happen. It can only be explained in one of two ways: Either Ratner is himself so powerful that those theoretically in power dare not oppose his mega-monopoly, or they will tolerate his personal mega-boondoggle because in a quid pro quo way they expect that their turn will come to similarly feed at the trough. Which is it? Neither would be good news. I think that the extent to which one or other is true depends on the individuals at whom we are looking. Mr. Oder identified Atlantic Yards interconnections for only 33 of the individuals on the list, including the obvious ones like Mayor Michael Bloomberg. I think it is possible to add to those 33; in some cases that may involve stretching a bit further to identify the Atlantic Yards connections; in other cases it involves stretching not so very far at all. I come up with a list that, with Mr. Oder's 33, tallies to 47, or nearly 50% of the entire list. Further research could perhaps lengthen the list still more. If you haven't yet read Mr. Oder's Atlantic Yards Report article about the the intersections of the other 33 individuals on the list with Atlantic Yards I suggest you proceed to read it now so you will have the whole picture. During a ten-year stretch roughly coinciding with the Great Depression, Universal Studios gave us a golden era of monsters: Dracula (1931), Frankenstein (1931), The Mummy (1932), The Invisible Man (1933) and werewolves as in the Werewolf of London (1935) and The Wolf Man (1941). You might also consider including The Phantom of the Opera with two principal release dates framing that decade (1925 for the original and a remake in 1943). The Dr. Jekyll and Mr. Hyde films, with versions made in 1931 and 1941, although in a similar vein, was not from Universal, produced by two other studios, Paramount and MGM, respectively. The fun thing about the monsters was that each came packaged with some hokum mythology not necessarily genuinely derived from classic source material. It was useful if the framework of the mythology was also serviceable for setting up damsel-in-distress scenarios. One such myth that served very well in this regard was the curse afflicting the cinema werewolves: That when they transformed they were compelled to try to kill the things they loved most. Why was I thinking about this old horror film trope about werewolves? 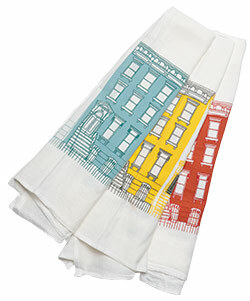 Because, reading New York Magazine’s “Best Bets” column I discovered that the Brooklyn Museum is selling in its gift shop tea towels celebrating the charm of brownstone Brooklyn designed by illustrator Claudia Pearson. 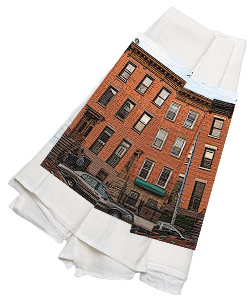 According to New York Magazine, Ms. Pearson is “Clinton Hill–based” and “drew inspiration from her surroundings” when she designed these towels. 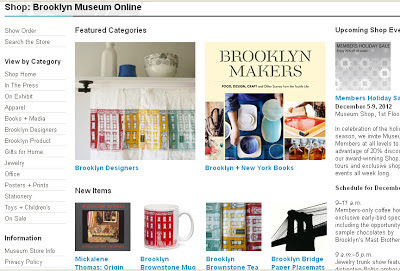 Presumably they are sold in the Brooklyn Museum in partial acknowledgment of the museum’s own “Prospect Heights” address and by way of making a statement of its oneness with a community comprised of and valuing what is being depicted. 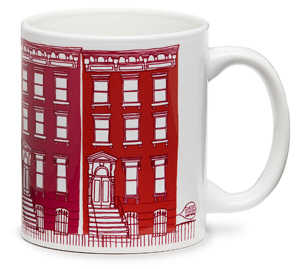 Rummaging around the internet I discovered that the Brooklyn Museum shop also sells a “Brooklyn Brownstone Mug” similarly designed by Ms. Pearson. 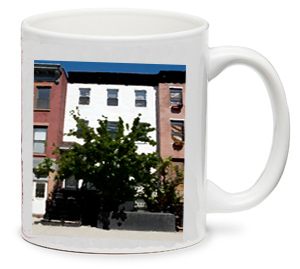 The not so humorous irony in all of this is that these same Brooklyn brownstone neighborhoods the museum is celebrating in its gift shop are beset by the prospect of some significant destruction and dismantling, with portions even being removed from the Brooklyn map altogether. The vortex around which this destruction swirls is Atlantic Yards, the heavily subsidized corporatizing eminent domain takeover a significant swath of Brooklyn by which Forest City Ratner is increasing its mega-monpoly stranglehold on the borough’s assets. Ms. Pearson’s Clinton Hill brownstone neighborhood, together with the Brooklyn Museum’s Prospect Heights brownstone neighborhood, both border the Atlantic Yards site footprint along with the other significant brownstone neighborhoods of Park Slope, Fort Greene and Boerum Hill. For all its negative implications for these neighborhoods and for the rest of the city’s population, Atlantic Yards was something the Brooklyn Museum, itself, helped to promote and bring about when, with key approvals hanging in the balance without which the mega-project could not have proceeded, the Brooklyn Museum decided to give a special award honoring Bruce Ratner, the head of the Forest City Ratner, the developer/subsidy collection firm responsible for it. In theory, the giving of the museum’s Augustus Graham award to Ratner was to signify that Ratner embodied, as a man, the praiseworthy attributes of community service and selflessness, something quite the opposite of what the Atlantic Yards project has truly been all about. 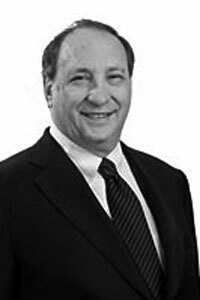 If the museum’s award honoring Ratner didn’t itself tip the balance toward Ratner’s obtaining the approvals needed, it certainly combined to exert influence with the things that did. The museum’s award to Ratner was publicly protested (with Ratner being characterized as a “vampire” among other things) but the museum has never apologized to the communities of Brooklyn for what it did. While the error of making the award should have been obvious at the time, that was before the mega-project significantly degenerated, and more and more underlying negative facts about it got publicly disclosed. (Abbreviating the list: The mega-project is now receiving much more subsidy than before, its design has been cheapened, unions have been double-crossed, the passage of time steadily exposes the sham and folly of the community benefit agreement signing and endorsements, the time frame for its build-out will be decades- perhaps forty years- not the ten years first advertised. And then there was the way that rightfully or wrongly Ratner skirted indictments when implicated in investigations.) . . .
. . . Notwithstanding that the negatives of the situation have become much more conspicuously abject, the Brooklyn Museum still has not issued an apology to the community or sought to reverse the travesty of its award to Ratner by reclaiming or renouncing it. Is there a way that the effect of the museum now honoring brownstone Brooklyn could be more starkly startling?. . 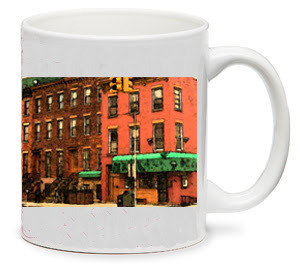 . . Ms. Pearson could design and the museum could sell in its gift shop, products (see below), tea towels and coffee mugs that depict Freddy’s Bar and Grill and the little nearby townhouses torn down to create the so-called “Barclays” arena and the now empty acres and parking lots Ratner owns around it. Maybe that would also be more appropriate in that the museum, as with its dusty old linen-wrapped mummies, often focuses on educating the public about what was and is now no more. 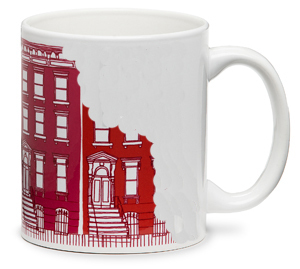 Should the Brooklyn Brownstone mugs in the museum shop show townhouses in the process of demolition like the ones below? 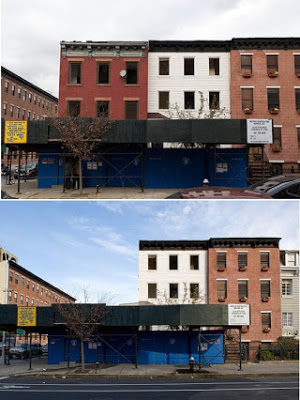 The Tracy Collins photos above that appeared in Atlantic Yards Report show the demolition of Dean Street townhouses before it was clear the land would ever be used for the Ratner project. Land on which they were sited is still vacant. If the Brooklyn Museum, set up as a charitable organization to serve the public, actually values Brooklyn and its brownstone neighborhoods, what was it that caused the lycanthropic transmogrification whereby it howled harmonizing tones of praise and support for Ratner as he wolfishly prepared to devour more of Brooklyn and its brownstone acres into his increasingly gargantuan government-supported mega-monopoly? The elixir that brought about that transformation was money. Despite what the museum’s Augustus Graham award is supposed to honor, Ratner was not honored for what he had done for the community: He was honored for the money he had given to the museum that had gotten his people placed on the museum’s board of trustees. Sometimes the idea that one kills the thing one loves is explored as a concept with serious real ramifications that are to be studied. Jane Jacobs, the great urbanist observer and thinker who wrote “The Death and Life of Great American Cities,” explored in that book a sort of `killing the goose that laid the golden egg’ concern in an urban planning context: She wrote (p. 246*) that the benefits of a diverse economy can be killed off by a rush of businesses coming in to take advantage of an “enviable location” so that the “enviable location” thereby ceases to exist. Or, alternatively, in another context, you can find theories that “killing the thing you love” is a beastly symptom of the alpha male urge to dominate at all costs. The situation with the still unapologetic Brooklyn Museum is neither of these. Although it’s a damsel-in-distress scenario with the public and Brooklyn’s brownstone neighborhoods in jeopardy and although the treacherous peril of this world becomes all the more frighteningly dangerous when that damsel’s self-proclaimed lover suddenly reveals a sinister face that is opposite to that mild and friendly one that has been shown before, the elixir that provokes that Jekyll and Hyde transformation here is simply money and there is no real magic or mystery to the transformation. It is simply the hypocrisy that money can so readily buy. Superstorm Hurricane Sandy changed around plans for a lot of people and it’s got to be acknowledged that for those most affected things won’t be the same again and such recoveries as may still be in store could be a long way off. One way in which things changed for many, although much less drastically, is that music performances touted by Noticing New York as alternatives for those eschewing the Ratner/Prokhorov-owned “Barclays” Center were cancelled. Coco Wilde, who runs First Acoustics cancelled the Saturday, November 3, 2012 evening performances of Suzie Vinnick appearing that night with Friction Farm. (In terms of time frame, that Saturday night was the evening preceding the marathon that the Bloomberg administration belatedly cancelled.) So, although I had promised this as one Saturday night’ alternative to Barclays fare it didn’t happen. I don’t know if it was any more irksome for those determined to go out and entertain themselves in that week following the storm that although Coco cancelled the First Acoustics night, the Barclays Center was open for a basketball game that night. During the recovery fray, the city and MTA mobilized special bus service in support of the event at the 18,000 seat arena. If you remember, the subways weren’t coming to Brooklyn. Coco says that Suzie Vinnick and Friction Farm will now perform in next year's 2013/2014 season. She says those with tickets for the cancelled night can use them for the next season performance, use them instead for (or bring friends to) another concert this season, or she will refund them. Another event that didn’t happen was Shepley Metcalf’s Thursday, November 1st performance at the Metropolitan Room singing the songs of Laura Nyro. Lower Manhattan was still without electricity at that point and that meant the Metropolitan Room on 22nd Street just west of the Flatiron building was dark and closed. And it would have been quite difficult for us Brooklynites to get to anyway without subways and no special supporting bus service for the establishment supplied by the city and the MTA. I can report, however, that nine days later with power restored to lower Manhattan together with much of the subway service linking Brooklyn to Manhattan, Shepley did make her second scheduled performance at the Metropolitan Room. The place was packed. I can also advise you that this Saturday’s First Accoutics evening featuring Anna Dagmar, Anothony da Costa and Caitlin Canty is going ahead as planned. I couldn’t help noticing, while at the Metropolitan Room, that they had posters up for upcoming performances by Pia Zadora. I don’t know what others in the world who don’t have the associations with Ms. Zadora that I do think of her. There’s an ample variety of reasons people are apt to think a lot about Ms. Zadora, starting with the fact that she famously starred as the Martian Princess in the 1964 film “Santa Claus Conquers the Martians.” My associations involve a fun-to-tell story (but I won’t tell it here) story that involves my good friend from high school, Randy Morrison going back to when Pia was performing in “Henry, Sweet Henry,” the Broadway musical adaption of the “The World of Henry Orient” with Don Ameche. Pia does a wonderful version of “I Thought About You,” one of our favorite songs, a song that claimed our attention mightily when it ws performed as a duet by Cynthia Holiday and Jim Malloy, backed by the Bob Cunningham trio, at First Acoustics. You may want to know that the most recently held First Acoustics performance, held the Saturday before that odd Sunday the subways were closed in anticipation of the pending storm, went spectacularly. The women of Red Molly, called back repeatedly by applause, found themselves confessing that they had run out of encores, and had to improvise. Penultimately, they sang our entrancing favorite, an a capella version of Susan Werner's "May I Suggest." And they finished up- I recall the suggestion came form the audience- with "Fever." Afterwards, I was able to confirm by talking to Red Molly’s Abbie Gardner that her, separate-from-the-group “My Craziest Dream” performance was going to involve backup support from her musician, song-writing father. I don’t know if it actually happened since that event was scheduled for November 3rd in Dobbs Ferry and Westchester, as we know, was also exceedingly challenged by power problems. It’s a performance I someday want to catch. I knew I was going to love seeing Red Molly at First Acoustics a second time and since I last saw them they have been very busy writing dulcetly superb new songs. The extraordinary pleasure I hadn’t experienced before was seeing the energetic Union Street Preservation Society. Their music went straight into my preferred playlist afterward and I told Coco she has to plan on having them back again, sooner rather than later. I told her she had to because, as extraordinarily good as they were that Saturday night, I argued we were only getting 80% of what they were capable of: They are regularly a five member (sometimes more!) band and one of their number had taken off that night because his wife just had a new baby. If they are this joyously good at 80%, I said, think what they will do at 100%. It turns out that Union Street Preservation Society has a background performing at Freddy's, the local bar and music venue that was razed along with a lot else to make way for the "Barclays" Center. They performed there not long before it was closed and they have now been performing at the new, reincarnated Freddy's farther out in Brooklyn the third Friday of every month. Union Street Preservation Society guitarist David Leiberman also recommends an upcoming integrated performance they will be doing with Andy Statmen and his trio at Barbès in Red Hook, January 17, 2013. Red Hook was hard hit by the storm and Barbès soon hosted benefit concerts for storm relief. I think that Mr. Leiberman, who was front and center much of that First Acoustics night, was taken, when I talked with him after USPS's performance, with my idea that any musicians deigning to perform at the highly subsidized "Barclays" Center should kick back their subsidy so that we can reduce by maybe $20 per, the cost of tickets to real local music entertainment in Brooklyn. What to expect this Saturday night? You could just let yourself be in for a surprise. . That’s a fabulous way to approach the Saturday nights of life. . . I have not yet heard any of the three acts performing Saturday night but the beauty of the internet is such that its connectivity makes it so easy to peek and guess about what the future might hold. Here's video of Anna Dagmar . . . would you say there’s a classically yearning relentlessness to the rhythms? Like an old Irish or English folk song? Coco assures me that on Saturday Dagmar, a pianist, IS bringing a classical quartet to back her up. And here is a video for Anothony da Costa . . . Quiet, exact, rolling guitar picks and wistful remorse? Lastly, not leastly, we have video of a Caitlin Canty ballad, one of four videos up her website. . . This is slow and pretty; she also has video of faster music. Hope to see you at the concert in Brooklyn Heights Saturday. More information about First Acoustics and the rest of this season’s performances is available and linked to in this article: Wednesday, September 19, 2012, Alternatives To The Scandalously Spawned, Scandalously Named Ratner/Prokhorov “Barclays” Center: Protest & Locally Nurtured Concerts. It Matters . . . Like Maybe "1000 Percent"? It will certainly be written, in the days to come, as among the most contentious developments in America's history--there's no question. . . It's not just New York history, it would be in the nation. The Forest City Ratner Atlantic Yards mega-monopoly is of course the larger envisioned land grab of which the arena, spearheading it, though itself gargantuan, is a just fractional part. I know Brooklyn as good as anyone, better than most. All of this is important, but more important than anything else is what Markowitz was addressing in his statement, the exact reason he felt it important to reconstruct the truth into something that was rather its opposite. What Markowitz was playing with was the issue of expectations. Expectations in human relations have a lot to do with what’s considered moral and what’s not. They also have a lot to do with what the law founds legal rights upon, including the law of land use and the control society establishes over uses to which land is put. I studied land use and land use control law in both urban planning school and law school. The issue of expectations came up particularly when I was studying out of a text, “Land Use Controls: Cases and Materials” by NYU professor John D. Johnston Jr. and my own professor, George W. Johnson, teaching the course at Brooklyn Law School. During the course of the year we were also reading essays about the economic underpinnings of these concepts of justice and the consonance with the way these evolving rules of justice produce benefits for society. When it comes to land use law, don’t move next to an airport and expect that the airplanes are not going to fly thunderously overhead. Conversely, if you suddenly put an airport in the middle of a residential neighborhood expect that the neighbors will do some rightful complaining. Similarly, if you locate yourself beside an existing train line, maybe beside the depot, be thinking in terms of owning a diner to serve the train travelers. But if a railway company runs a new train line through a residential neighborhood and is belching smoke, making noise and sending cinders into the sky that are causing local fires and igniting local homes, figure that you’ll be sued and will probably have to shell out for some damages, notwithstanding that the government may have assisted you with eminent domain and subsidies to help you locate the new technological advance of your rail line advantageously where you wanted it. This being America, a new nation with vast open expanses to be claimed (and the fact that we tend to forget about the original native Americans or their rights) the law tends to pay lot of deference to those who (among the newly arriving European Americans) got to a location first. If, in early America, you located a glue factory (that most famous example of nuisance proscribed regularly by so many restrictive covenants regulating land use in old deeds) out in the middle of what people thought of as nowhere you’d probably be okay, no bother, but don’t go and locate the same activity close by a town where people are already living. Now, what about those railroads that, though noxious in previously unforseen ways, the government still thought should be located nearby already existing homes so trains could get into the center city: Do the neighboring home owners whose homes have lost value have a remedy? If the noxiousness they have to live with is sufficiently bad they probably have a remedy in “inverse condemnation.” Those who have a rudimentary familiarity with the Atlantic Yards saga will be acquainted with what “condemnation” means in the context of eminent domain and also how eminent domain was abused for the Atlantic Yards mega-monopoly, essentially privatizing its purpose as well as who was in the driver's seat when it came to the government using its power to take local real estate away from other private owners to give it to the Ratner firm and thereby squelch local competition. “Inverse condemnation” is the name of the kind of lawsuit people can bring when the government effectively deprives property owners of the expected value of their land without first formally condemning their property or compensating them for it. In effect they say to the government: “Though you didn’t legally seize or take my property rights, you have now done so as a practical matter so the legalities of appropriate compensation should follow.” Railroads, although they are technically private entities, can be sued in “inverse condemnation” because the regulating involvement of government has essentially blended them into government for this purpose. The railroads can also be sued via a lawsuit brought for nuisance although if the activity the government is specifically permitted is unavoidably a nuisance the remedy granted would be to collect financial compensation damages only, not an injunction to cease the activity. The arena and its owners are much analogous to the railway companies of the days of yore. In the area of land use control it is not always a question of who came first that permits or proscribes what uses will be permitted where. In the modern United States our set of expectations regarding what can and can't be done with land gets reshaped through zoning. Zoning amounts to a surrendering of rights of owners to use property as fully as they otherwise might expect to be able. That would be a diminishment of the value of the land for which the owners are not paid except that the concept is that if everyone surrenders, having their rights restricted, everyone in the end benefits because society as a whole benefits. That underpinning concept is not, however, so arguably applicable in the case of Atlantic Yards where Forest City Ratner designed all the restrictions that apply to the Atlantic Yards project, thereby making it, in essence, preferentially subject to no restrictions at all, while neighboring property owners are subject to a normal and conventional set of real restrictions. Markowitz in his New York Magazine article quote does acknowledge that there are residential brownstones on Dean Street within the area near the arena he was talking about. For the sake of blaming those who chose to live in the residential buildings of the neighborhood of being the victims of their own illegitimate expectations Markowitz sets up something of a false dichotomy: If a neighborhood can’t be called a “bedroom community” then it must be a “business district.” But most residential neighborhoods in New York are something more in-between. Brooklyn Heights, Greenwich Village, Williamsburg, Astoria are all residential neighborhoods but all have streets and intersections bustling with ground floor commercial activity, a lot of which. . . restaurants, clothing stores, opticians, and phone stores that seem to be the modern purveyors of electronics. . . are entirely consonant with the residential use being made of most of the neighborhood space. That’s something important to remember when you look at the minority of pictures in this article where you see commercial space. What To Not Expect When You’re Expecting? Maybe Scarlett O’Hara’s dad thought he was in control of Tara’s perimeter, but down here on the street we know better. We know that vacant lot next door that has been letting in the breeze and sun for twenty years could be sold tomorrow, turning your view into a sheer wall. That’s not true. Certainly one can often find oneself surprised by development in New York and expectations that turn out not to be true but the arena could be placed where it was only because of what nobody should ever have expected: Government officials chose to supersede zoning and those officials also chose to abuse eminent domain in unforeseeable ways. One thing you get a feeling for studying the law of land use control is that it took generations to develop the laws that control land use, including what people think are the best zoning approaches and ways to administer the zoning laws. That includes concentrated efforts to think out (explaining the thought process along the way) procedures for how zoning in an area is best changed and how exceptions should be granted. All of that was worked out in the context of adversary parties contesting ideas in the courts of law or political constituencies competing to have their ideas recognized and given weight. The arena and the larger Atlantic Yards mega-monopoly were conceptualized by an entirely different process: Past wisdom and precedent were disregarded and it instead became a one-sided process of unelected state employees at an obscure but powerful public authority, the Empire State Development Corporation (the actual name of which is the Urban Development Corporation), figuring out how far they could push the legally permissible envelope to benefit the developer over all those who were not partaking in this process, which was basically everyone else. In doing so they used powers that agencies had been granted for purposes never intended or foreseen. Because these obscure unelected officials were endowed with the authority of government the courts that normally oversee these processes (and are instructed to in New York in the case of eminent domain) concluded (I think incorrectly) that they had to defer to whatever the developer and these officials did with little or no examination. Perhaps these obscure government officials credited themselves with the ability to know better than the accumulated wisdom of preceding generations, prior established jurisprudence and zoning code insight that would have prevented the arena from being located where they wanted to put it. Alternatively, they may have thought that they could supervisorily oversee the arrival of the arena in a fashion that wold supersede any and all negativities residential neighbors would experience. If they thought that, push now coming to shove has proved that they haven’t, in fact, managed to figure it all out yet. Finger To The Wind Predicts a Residential Neighborhood. . . Successfully! When people locate in New York they do take into account that the neighborhoods they pick to live in are likely to change. There is always the possibility that one might be wrong but the typical New Yorker probably prides him or herself on being pretty good in sensing where a neighborhood is likely headed and like card players they place bets on whether they want to stay or they leave for another neighborhood they pick what they suspect could be a luckier hand. For those who relatively recently moved next to what just became the arena superblock, they knew they were moving next to completely and newly renovated residential buildings. The photos in this article don’t show those newly renovated residential buildings torn down to make way for the arena. They can be viewed here: Tuesday, October 16, 2012, “Barclays”? Atlantic Yards? : On Lopate, NY Mag Architectural Critic Justin Davidson Disses Brooklyn Neighborhoods With Manhattancentric Illiteracy. Those renovated buildings represented an already emerging trend that looked almost certain to continue and probably would have. And even if the Ward Bakery Building, an old bread factory, was where it was because was part of a manufacturing district, the expectation was that it too was likely to be renovated for residential use. Again, the probabilities are reasonably high that that would have happened. If not, the beautiful old building would have been adaptively reused in some other way quite compatible with the surrounding residential neighborhood and historic district. For those who put their moistened fingertips into the air to determine which way the neighborhood was headed the best possible clue about where their neighborhood was headed can be provided in retrospect: Except for the arena, Forest City plans to build nothing but residential buildings on all the land it seized from all the other local private owners by eminent domain and on the land it was given by the MTA for a below-market price in its no-bid political deal. So, if people moved to this neighborhood as Mr. Markowitz describes, thinking it was assured of trending to a residential neighborhood, they were, except for the arena, pretty much dead on on the money. Ironically, some of those making this otherwise correct guess about the future residential character of the surrounding area may have been homeowners purchasing new, recently built (in the 90's) brownstone-style townhouses in the Atlantic Commons development directly from Forest City Ratner. The Ratner firm received heavy public subsidies to build that complex of homes, which is another story worthy of revisiting. There is another way that Mark Jacobson's notion in his New York Magazine that New Yorkers can’t have expectations about the future of the neighborhoods is false: There are many New Yorkers who can expect with virtual certainty that the state will never override local zoning, or use eminent domain or demap streets and avenues to put an arena across the street from them. That includes Mayor Bloomberg in his townhouse just off Central Park, the residents of upper Park Avenue on Manhattan’s East Side, the neighborhood of Brooklyn Heights, and the list goes on and on. Despite Mr. Markowtiz’s cheerleading for Forest City Ratner and the arena and his declarations that it was a victory for Brooklyn, the arena was only placed where it was because most of the Brooklyn populace is relegated to second class when it comes to political power. New York is full of mixed uses. There are those like the famous urban theorist Jane Jacobs who would even argue that compatible mixed use environments constitute an ideal to be striven for. Is it therefore really so bad that the arena, an unusual, if extreme, example of mixed use arrived in this neighborhood, upsetting expectations and turning things upside down with its corporatizing top-down environment style transformations? You could try to make the argument that it isn’t so bad, but the fact that the borough president wants instead to argue against the preponderance of apparent fact that the arena wasn’t squeezed into a residential neighborhood environment is a clear indication that there he is uncomfortable with people really understanding and appreciating the actual result. Photos other than this panoramic collage, working counterclockwise around the arena site, have been looking, through the connections of neighborhood streets, toward the arena. This, looking away from the arena (where there isn’t a connector street) shows how the arena’s main public space is oriented to Ratner’s mall across the street, forming what may be spoken of as a business district. The malls turn their back on surrounding neighborhood. Markowitz is, in the end, an inexcusably inveterate cheerleader for Forest City Ratner and the arena anytime, anywhere and at all costs: When the other day he appeared before the Unitarian Congregation to proclaim that he knew “Brooklyn as good as anyone, better than most” he also went out of his way to invite the congregation to cheer for the Nets. . .
. . Was it presumptuous for him to do so? The congregation, to which I belong, has not yet formally joined the many Brooklyn churches who with their clergy have joined together to decry the many injustices of the arena and its creation. Surely though, Mr. Markowitz must sense the truth, that even absent any formal declaration by the congregation in joining these other churches (something the congregation may yet do), there is a strong sense on the part of many of its congregants respecting the injustices behind the creation of the arena and Atlantic Yards. The violation of expectations that Mr. Markowtiz is intent on obscuring is probably one of the least of the major injustices involved in bringing about Atlantic Yards. Mr. Markowitz's invitation to cheer for the arena and the Nets was therefore necessarily provocative of enormous discomfort. I, for one, when invited by Mr. Markowotz to cheer, could think there was only one appropriate response: I hissed. The pictures in this article are only the pictures of the parts of the neighborhood surrounding the arena itself. As I said, you can decide for yourself how much they mostly reflect a fair amount of residential character. Also again, to see the residential character of what was removed to make way for the arena, what people in the neighborhood previously lived next to, go to Noticing New York’s earlier article: “Barclays”? Atlantic Yards? On Lopate, NY Mag Architectural Critic Justin Davidson Disses Brooklyn Neighborhoods With Manhattancentric Illiteracy. . . That still leaves the issue of the character of the neighborhood that surrounds the nearby superblock of parking that was newly created to support the arena. What kind of properties surround and are being subjected to having the superblock of parking as a new neighbor? Suffice it to say it is more property of a residential character, much of it again part of brownstone Brooklyn, but my pictures demonstrating that will have to await a soon forthcoming follow-up Noticing New York article. Looking west on Pacific Street at residential buildings that might consider that they are blighted only because of the way the Ratner PC Richards building turns its cinder block back on them. Lit-up arena terminates the street it closed.